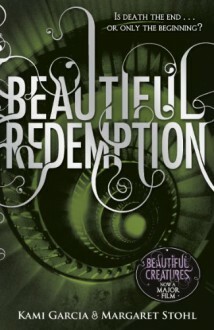 Beautiful Redemption is the much-anticipated finale of the spellbinding love story that began with Beautiful Creatures - a romance that is bound to capture the hearts of Twilight fans everywhere.One night in the rain, Ethan Wate opened his eyes and fell in love with Lena Duchannes. His life would never be the same.Ethan always dreamed of leaving the stifling Southern town of Gatlin.But he never dreamt that finding love with Lena Duchannes would drive him away. Lena is a Caster girl whose supernatural powers unveiled a secretive and cursed side of Gatlin, so powerful it forced him to make a terrible sacrifice.Now Ethan must find a way to return to Lena - and Gatlin - as she vows to do whatever it takes to get him back. Even if it means trusting old enemies or risking their loved ones' lives.Some loves are meant to be. Others are cursed . . . Can Ethan and Lena rewrite their fate and their spellbinding love story in this stunning finale to the Beautiful Creatures series? *Don't miss the Warner Brothers and Alcon Entertainment blockbuster movie of Beautiful Creatures directed by Richard LaGravenese (P.S. I Love You) and featuring an all star cast including Emma Thompson, Jeremy Irons, Viola Davies and hot young Hollywood talent Alice Englert, Alden Ehrenreich and Emmy Rossum. Praise for Beautiful Creatures:'Watch out Twilight and Hunger Games' - The Guardian'Move over Twilight, there's a new supernatural saga in town.' - E!About the authors:@kamigarcia is a superstitious American southerner who can make biscuits by hand and pies from scratch! She attended George Washington University and is a teacher and reading specialist. She lives in Los Angeles, California with her family. @mstohl has written and designed many successful video games, which is why her two beagles are named Zelda and Kirby. She has degrees from Yale and Stanford Universities in the US and has also studied in the prestigious creative writing department at UEA, Norwich. She lives in Santa Monica, California with her family.Also available in the series: Beautiful Creatures, Beautiful Darkness, Beautiful Chaos and exclusive ebook short story Dream Dark. Poorly executed wish fulfillment. Read my full review at Notes in the Margin.